I have been way off track in my eating habits lately. Why is it that I can be going along and doing so well, then BAM! KAPOW! I am eating sweet things like there is no tomorrow. It’s like, I know it starts happening but I don’t stop it. Is this binge eating? I have heard so many podcasts from Half Size Me, and Heather touches on this subject quite often. Although I have heard stories from different people being interviewed, I never really thought that I was someone who could be classified as a binge eater. Sometimes I would hear the interviews and wonder to myself if I had some of the same struggles, but would quickly shrug it off. I mean, after all, I never really ransacked my kitchen and ate everything fast and furious, hand over fist. This is the image that always comes to my mind when I hear the words “binge eat.” Although Buddy the Elf is funny, I realize that the subject is not. Here’s what happens: I do awesome, I track everything, I eat the right things, I work out, and I even allow myself treats (because I know what happens if I don’t). Then somehow, someway, I sabotage all my efforts. Tonight I started thinking about all this. I had thought that I have been off course for maybe 2 weeks, but in looking at my WW tracker, I can see it has been almost a month!!!!!!!!!!!!!!! Geez Dana! Get it together girl! I decided to play detective and try to pin point why I got off course. I think I may have found some clues. Clue 1: First off, for my weigh-in on August 23rd. I had lost down to my 220’s and realized that I if I tried really hard, I could be in Onederland by the end of the year. I only have a little over twenty pounds to go! I remember sitting in the meeting beaming inside. Yet, those thoughts led to how I had lost all my weight before, got into Onederland, and to my goal weight, then my life went topsy turvy. I ended up gaining almost all my weight back. Something I said I would never do! Clue 2: That same week, I decided to eat a cream filled Long John from Publix. I know that this treat is one that I definitely lack self-control with. I actually prefer the powdered sugar ones they make, and luckily they rarely make them. Well, that day I was shopping and I hadn’t been feeling the greatest and saw some chocolate iced cream filled Long Johns. 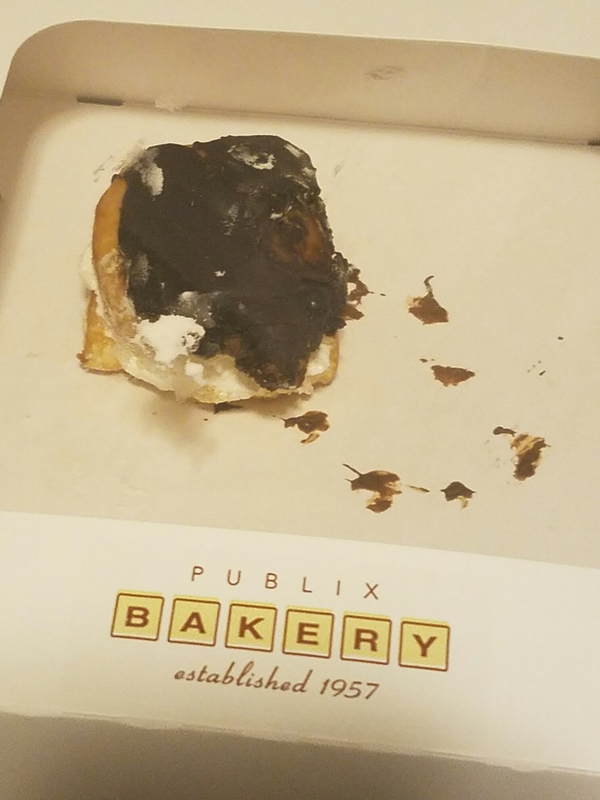 I had been getting my husband treats from the bakery whenever I go to Publix, but rarely got myself one, so I decided that I “deserved” one that day. The only thing is, I bought 2…not one Long John, but 2 Long Johns. BIG MISTAKE! I ate one on the way home and figured I would eat the other one later. I got home and started thinking about how embarrassed I would be if my husband knew I got myself two donuts. He definitely would never say anything to me, and never has before. I started eating the donut before he got home because I didn’t want him to see it. I started feeling ashamed of myself and stopped eating it because I felt so disgusted with what I was doing. I put the donut back in the box right about the time I heard my husband come home. You know what I did? I hid the box like a little kid. Seriously? What is wrong with this picure?? After the coast was clear, I started thinking about my love of cream filled Long Johns and how I am somehow obsessed with cream filled pastries, etc. I really believe somehow they are my nemesis. The root of the problem, I believe, comes from when I was a little girl and ate some Cream Horns that was designated for my step-dad’s lunch. I got in a lot of trouble for eating them. I think it was because we didn’t have a lot of money back then and they were his special treat for lunch. I really don’t remember why, I just remember crying a lot because of it. So, I think there is some kind of connection here. I decided right then and there to not eat cream filled donuts or any donut for six months. I even told God that I would fast them for Him. No, God did not tell me to do that, I just wanted to do it because I felt so out of control. I took a picture of my half eaten Long John and marked the day in my calendar. I don’t think there needs to be any more clues. Now, I just need to figure this out. Why do I self-sabotage when I get close to my goals and am doing so well? Of course by me telling myself that I can no longer eat Long Johns, I am eating every other kind of sweet that I can, but not just as a special treat. I am treating myself way too often. Where is the balance that I seek? I am praying and asking God to help by giving me wisdom and knowledge on what to do, and how to do it. In Phillipians 4:13 it says, “For I can do everything through Christ, who gives me strength” This is my mantra. I understand completely! If we start the see sugar as the addiction that it truly is, our binges make much more sense. I have been working so hard to lose weight, myself. I’ve been working at it for several weeks without seeing many results. Just as I’m started to see a little movement in the scales, I sabotage my efforts by eating not one, but two candy bars! Followed by popcorn with real butter! UGH! !